Nigeria has again called on nuclear-armed States for the total elimination of their nuclear weapons, saying they are “inhumane weapons”. The debate was on the Second Preparatory Meeting of the 2020 Review Conference of the Parties to the Treaty of the Non-Proliferation (NPT) of Nuclear Weapons. “As a result, we must not allow this auspicious conference pass into history without targeted outcomes. We must seize the opportunity it offers to reaffirm our commitment to the NPT”. 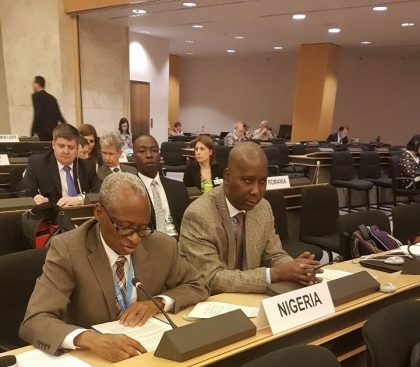 Nigeria reaffirmed its support for the goal of general and complete disarmament, saying we believe that nuclear disarmament and non-proliferation are mutually reinforcing. Kadiri said nuclear disarmament remained the only effective path to non-proliferation, pointing out Nigeria’s unrelenting commitment to a nuclear-free world by its ratification of several non-proliferation protocols. These are the 1997 model additional protocol, the safeguards agreements with the International Atomic Energy Agency, the entry into force of the Treaty of Pelindaba, and as a co-sponsor of the de-alerting resolution. “In addition, we support the growing focus on the humanitarian consequences of the use of nuclear weapons,” the Nigerian envoy said. Nigeria said it continued to welcome any gesture by nuclear-armed States to reduce their stockpile adding, however, its highest expectation is for these States to wholly eliminate their nuclear arsenals. The Nigerian Permanent Representative said: “The African Nuclear Weapons Free Zone Treaty (Treaty of PELINDABA) continues to consolidate on the objective for its establishment.